You'd think in this economy that the credit card companies would stop mass mailing pre-approved applications to sign up new people for new credit. While they might slow down on the deluge of mail they send out daily they won't stop entirely. I used to get a lot of unsolicited offers for credit cards but some time ago I opted out of the offers and they've stopped entirely. Now the only credit card related offers I get are from credit cards I've already got. Its easy to opt out of unsolicited credit card offers. The FTC explains the process on their page. Call 1-888-5-OPTOUT (567-8688) or visit www.optoutprescreen.com and do it there. The whole process on the website can be done in a few minutes. Below I give the step by step process for opting out. Step 2: Click the button at the bottom. You could also chose to opt out via mail permanently if you want. That process requires you to print out and mail a form in. You have to give your name, date of birth, social security number and address. You'll also have to fill in the random security code at the bottom. Step 5: You're done and you should get a confirmation to print. It will then list your name and other information for reference. Print out the confirmation and keep it for your records. 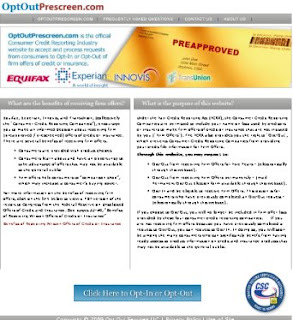 It will take a few days for the opt out to get processed by the credit bureaus. After that the credit card offers should stop within weeks. If at some point you want to opt back in then you can repeat the process above but choose the opt-in option in step 3. Opting out via the website lasts for 5 years. 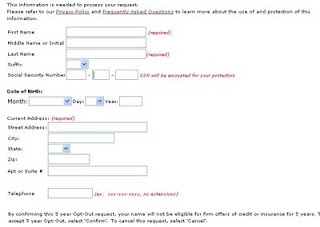 So you will need to renew the opt out again in 5 years.